Found a cool little flash content management system for images and vids. 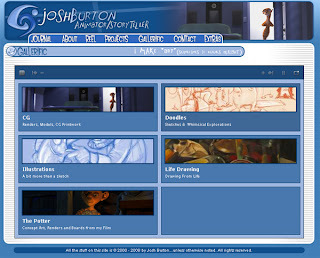 So I updated the Gallerific section of my site. Added a bunch of Potter concept images and all the boards as well which I don't know if if I've put up before come to think of it. It's HIGHLY customizable. Neato. Can't wait to play with the vid feature once I have some time to export some movies to put in there. It'll have to wait till after the wedding/move/vacation. Gotta run and get an oil change before work. Lata! A classical pose...for a troll...? Note - This'll prolly be the last update on Olaf for a bit. Some major forks in the road are quickly approaching - 1) I'm getting married in a couple of weeks , 2) Moving to Houston, 3) Transitioning to a freelance/contractor from being an employee so it's gonna be a "wee" crazy. Crazy good that is! I've been playing with John Doublestein's autorigging system the last two nights and I have to say it's pretty awesome. John works with my buddy Dave and we're using his rig for Dave's film. I hadn't realized a bunch of the neat little features workin so far on the film. He's got some great little right click menus that get built when you rig a character that snap between fk and ik. An extra curl on the hand that allows that pinky and ring finger base bones in the hand bend for a proper fist. 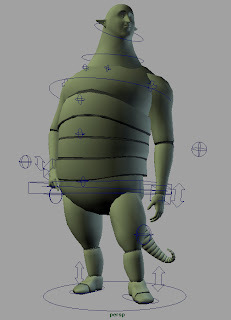 Speaking of Maya 2008, the new smooth skin weights feature is awesome. I saw it in a Austin 3d user group meeting a couple months back and had been dying to play with it. Joint placement and orientation is critical but this matters regardless of what rig you're using. Having the ability to quickly try out joint placement by quickly adding an arm rig and a default skinning is a great boon to the work flow. Facial Rig - This is where I wanna spend some time over the next...well while...got a bunch of things I wanna try. I'm planning on blogging that process pretty well so tune back in if you're interested. Fingers are a pain in the rear to model well so that the proportions work to "roll the finger" on itself. If anyone knows a good tutorial or book on the subject, by all means let me know.